Last month’s Not Your Mother’s Therapy was the first 2-Minute Mind Check event that I had attended, a compelling delivery by two experts from the front lines of mental health and depression treatment: Dr. Stu Eisendrath with the UCSF Depression Center, and Dr. Alison McInnes with Actify Neurotherapies. With a keen interest in mental health and emotional education for many years, I always seek out activities and contents that broaden my knowledge in this field, so I came to the talk with a desire to learn more. As a beneficiary of and advocate for psychotherapy, I found the evening to be both resonating and highly informative. Dr. Eisendrath’s research into Mindfulness-Based Cognitive Therapy (MBCT) expanded my existing knowledge in and experience with traditional Cognitive Behavioral Therapy (CBT) and mindfulness practices. And Dr. McInnes dove deep into additional therapies for Treatment-Resistant Depression (TRD), topics that I wasn’t familiar with before but now am curious to dig deeper. The evening began with Dr. Alison McInnes’ discussion on the essentials of getting properly diagnosed for depression. 350 million people suffer from depression worldwide, leading to nearly a million suicides every year. Getting properly diagnosed is the first step to healing before patients get to an irrevocable downward spiral. In her first session, Dr. McInnes explained what a psychiatrist observes and conducts to make a diagnosis, including a standard clinical interview, patient health questionnaire, lab tests, and more. I’ll write more about Dr. McInnes’ sessions in the next blog post. Next, Dr. Stu Eisendrath examined a type of therapy treatment for patients that suffer from Treatment Resistant Depression (TRD): Mindfulness-Based Cognitive Therapy (MBCT). 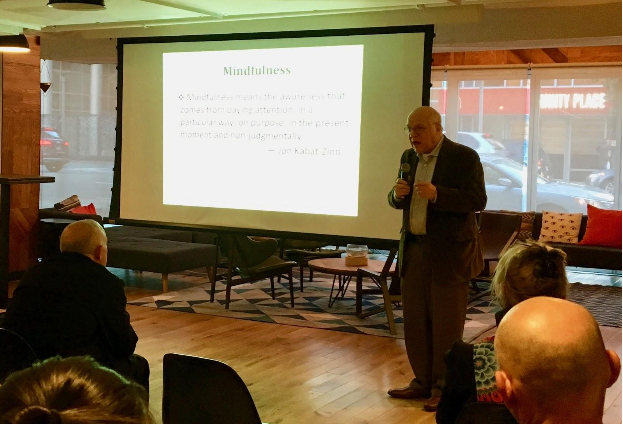 An interactive session, Dr. Eisendrath opened with a question to the audience on everyone’s experience level with mindfulness, and we all pleasantly discovered a community of folks familiar with the practice. As a tool for treating depression and anxiety, mindfulness is defined by Jon Kabat Zinn, the Founder of Mindfulness-Based Stress Reduction, as “the awareness that comes from paying attention, in a particular way; on purpose, in the present moment and non-judgmentally.” How can mindfulness practice be integrated into systematic depression treatment? Before unveiling the application of mindfulness and MBCT in depression treatment, Dr. Eisendrath elaborated on the pervasiveness of depression around the globe. Depression is the number one cause of disability in the developed countries, and is projected to become the major cause of disability worldwide by 2020, outstripping other diseases such as dementia and cancer. Treatment Resistant Depression (TRD), the focus of Dr. Eisendrath’s talk, is a particular type of depression that the MBCT targets. TRD is usually defined as a patient who doesn’t respond to two or more antidepressant trials. Generally speaking, about a third of the patients receiving one antidepressant will recover completely; for those who don’t recover from the first antidepressant, about 15% will recover after the second. Even after four treatments, about 57% of the patients still do not fully recover, justifying the immense challenges of treating depression and the long-term disability that it causes. TRD therefore is associated with greater disability, mortality, risk of relapse, and societal cost than those who suffer from non-resistant forms of depression. So where does mindfulness come in? MBCT is a group-based, 8-week, skills-based program that combines mindfulness meditation with concepts of Cognitive Behavioral Therapy (CBT) specifically developed for relapse prevention after patients fully recover. Through MBCT, patients learn to disengage from habitual (“automatic”) dysfunctional cognitive routines, particularly depression-related ruminative thought patterns. MBCT not only incorporates a wide range of formal practices such as body scan, mindful stretching/yoga, and silent meditation in the weekly sessions that patients attend, but it also teaches patients to informally integrate mindfulness into their everyday activities such as practicing mindful eating. Multiple studies have shown that compared to treatment as usual, MBCT has demonstrated significantly better results in preventing another episode of depression. This means that a fully-recovered depression patient who receives MBCT afterwards has a much better chance of staying free from depression compared to patients without MBCT sessions. Even for patients who receive maintenance antidepressants after recovery, MBCT as a replacement produces an equal chance in preventing relapses long-term, a powerful illustration of MBCT’s potency to approximate medication. Why does MBCT work? Dr. Eisendrath further broke down mindfulness to reveal its effects on depression patients. It encourages us to focus on the here and now, increasing the chance of staying free from both depression and anxiety. The reason is that patients with these two types of disorders feel they either have already experienced a loss in the past (depression) or are anticipating a loss in the future (anxiety), feeling badly in both situations. Given that depression and anxiety are on a time continuum, mindfulness brings our attention to the present moment, and decreases ruminating and self-criticizing thoughts such as “If only I had spoken up to my boss…” or “If only I had done it differently...” With a selective attention on a narrow area such as our breaths, here and now, we reduce the bandwidth available for focusing on depressive themes. Dr. Eisendrath then invited us all to engage in a brief mindfulness practice. With my feet planted on the floor, I first gently closed my eyes, focusing on my breaths moving in and out of my nostrils. Next, Dr. Eisendrath asked us to count each time we breathe in, but if our mind started to wander, we’d go back to zero and start counting again. After a few minutes of silence and as we brought our attention back to the room, aside from feeling peaceful and relaxed, some audience members also reflected on their wandering minds during the breathing exercise, easily distracted by the surrounding noise or interrupting thoughts. In addition, when asked if anyone was self-critical toward not being able to focus, a few hands rose as well. Through this exercise, Dr. Eisendrath reveals that for depression patients, there’s a big inner critic saying “I’m not doing this right”, and the average number of breaths that people typically count to before the mind wanders is three. Our mind wanders all the time, generating thought after thought; and in depression, these thoughts tend to be negative. Focusing our attention through mindfulness, we can more easily let go of the negative thoughts and decrease rumination, both powerful factors in treating depression. Studies have repeatedly shown that women in particular have higher rates of rumination, so being aware of that can help women build their mindfulness muscle through day-to-day consistent practice. Mindfulness also increases decentering, which helps us disassociate ourselves from our thoughts. We can observe our thoughts from a distance without letting them define who we are. Enhanced self-compassion is another positive effect of mindfulness, which emphasizes a non-judgmental or non-criticizing view of self. If I made a mistake and criticized myself for being dumb or not good enough, that’s judgment right there, and self-judgment tends to exacerbate depression. On the other hand, if I shifted to the lens of self-compassion and said instead “I made a mistake, and it’s just part of being human,” I spread my sense of common humanity and cultivate more empathy towards both myself and others. Readers may wonder what’s the difference between MBCT and traditional CBT approaches, and Dr. Eisendrath spent a few minutes on the comparison. Aside from the physical symptoms of depression, many of the symptoms are also thoughts. In fact, there are 30 most common depression-related thoughts cataloged, a major one being “I’m worthless”. Through CBT, we are taught to shift our thought from “I’m worthless” to “I helped an old person cross the street today, so I’m not a completely bad person after all.” While in the mindfulness approach, we say to ourselves “I’m having the thought that I’m a worthless person”, immediately creating that decentering and distancing between myself and my thoughts. From there, we have the choice to say, “How do I deal with that thought then? Well, maybe I can return to my breath for now and let that thought go.” In CBT, individuals challenge unhelpful thoughts and try to replace them with more beneficial ways of thinking, whereas in MBCT the focus is on distancing from and letting go of thoughts without judgement. Dr. Eisendrath then shared some of his research from the Practicing Alternative to Heal from Depression (PATH-D) Study. In this trial, MBCT was compared to an active control condition, the Health-Enhancement Program (HEP), which consisted of nutritional counseling, physical exercise, and music therapy. Questions such as “is MBCT an efficacious augmentative treatment for reducing depressive symptoms in adults with TRD after 8 weeks?” or “What brain changes occur with MBCT?” were answered. The results showed that both programs had beneficial effects, but MBCT more significantly reduced the severity of the depressive symptoms compared to HEP. Furthermore, fMRI scans revealed that MBCT was correlated to a significantly increased activation in the brain enhancing the emotional regulation system compared to HEP. It also decreased activation of the ventral affective processing system, which is high in patients suffering from depression and anxiety. Finally, Dr. Eisendrath shared a few valuable resources that help us practice mindfulness and meditation in our own time. For readers interested in learning more about MBCT, simply visit AccessMBCT.com and you can find the information you need, even discover different centers or teachers around the world that offer MBCT programs. Other physical sites including Spirit Rock in Marin County, Insight Meditation Centers, and San Francisco Zen Center, along with various meditation apps such as Calm, Insight Timer, and Headspace, are also available for us to explore mindfulness. I’m grateful to Emily Hine, the moderator of this conversation, and to the whole team at 2-Minute Mind Check (2MMC) who hosted Dr. Eisendrath in this informative conversation, Not Your Mother’s Therapy. As a San Francisco Bay Area community initiative aimed at helping employees in the Bay Area determine where they stand on the depression scale, 2MMC is a great place to find resources for you or your loved ones who are suffering. In my next guest post, I’ll dive deeper into Dr. Alison McInnes’ sessions for the night on getting properly diagnosed for depression and additional therapies for Treatment Resistant Depression. Stay tuned! P.S. Don’t forget that you can check out more helpful blogs, as well as free depression tools and resources at 2-Minute Mind Check.